The effects of aging on skin are multiple: fine lines, wrinkles, discoloration and sagging. No single ingredient can address them all. 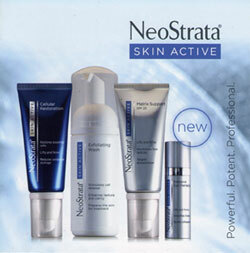 That’s why the Neostrata Skin Active regimen combines powerful, clinically proven ingredients that work synergistically in all layers of the skin to help reverse the visible signs of aging. These potent SynerG formulations stimulate cell renewal, even tone, boost collagen and protect against oxidative damage. Lines and wrinkles are smoothed from the inside out. Skin looks healthier, firmer and younger. Glycolic Foaming Wash: A medicated foaming cleanser which contains 18% glycolic acid, 2% lactobonic acid. Regular use will leave the skin smoothly textured and may reduce the appearance of fine lines and wrinkles. Hi-Potency glycolic cream: (18% glycolic acid, 2% lactobionic acid) is a potent cream formulated to exfoliate, moisturize and restore skin. The lactobionic acid and Vitamin E help fight future damage. Bionic face cream : (8% gluconolactone, 4% lactobionic acid) is a high-strength highly emollient cream designed to provide intensive moisturization while removing the dead cell layer of the skin that blocks pores. Developed by Dermatologist Dr. Carl Thornfeldt, Epionce was founded in 2002 for anti-aging and improve the visible appearance of problem skin. Regenica was developed by one of the leading scientists in regeneratve medicine who discovered that, by mimicking the embryonic environment, she could produce a younger, fresher set of Growth factors that are present when skin is in its most regenerative stage. 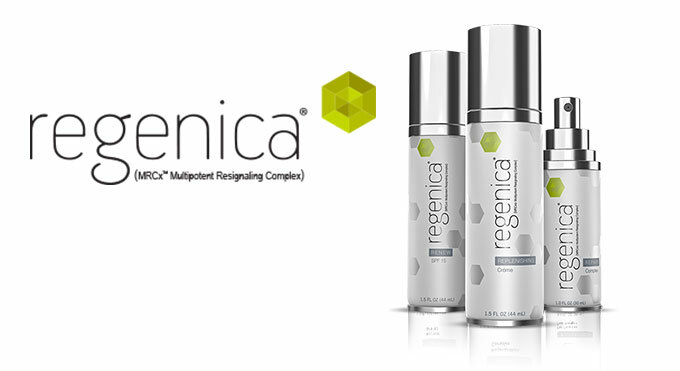 Regenica skin care is created with MRCx next generation growth factor designed to supplement growth factors in skin that you have lost over time. We like to use this in conjunction with micro-needling with continued use at home.